Diners order gourmet grilled cheese sandwiches at Cheesie's Pub and Grub. The restaurant opened Tuesday in Evanston. Northwestern students and Evanston residents lined up on the sidewalk outside newly opened restaurant Cheesie’s Pub & Grub on its official opening Tuesday night, waiting to try out the many varieties of “Perfect Grilled Cheese” for 50 percent off all purchases. 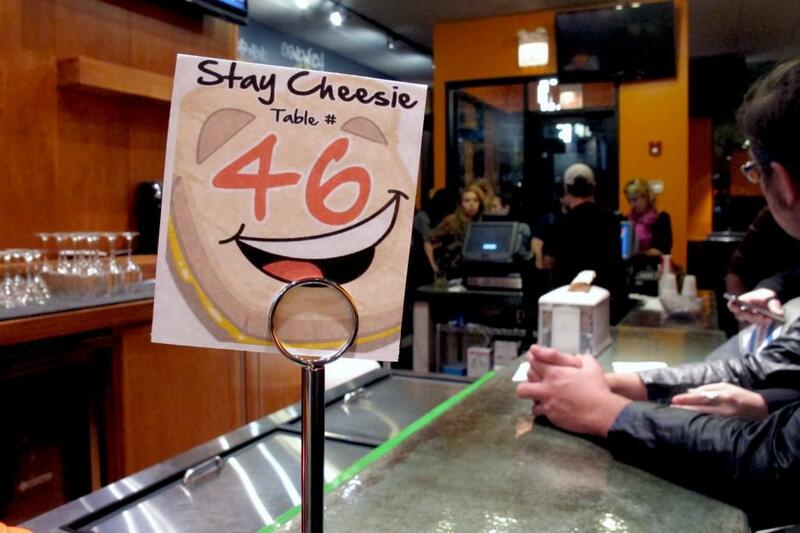 Chicago resident Chris Johnston, Cheesie’s owner, said NU’s grilled cheese-loving student population attracted him to Evanston. Johnston said Cheesie’s official hours are 10 a.m. to 3 a.m., but the restaurant will stay open longer if necessary to accommodate student needs. Students, residents and neighboring businesses alike welcomed the newest downtown Evanston business, 622 Davis St., which filled the vacancy left by Austin’s Tacos. “I got really excited when my manager told me about the opening,” said Shannon Sullivan, who works two storefronts down at Jamba Juice. Cheesie’s Evanston location is Johnston’s second restaurant. The main branch is located in Lakeview, Chicago, near the Belmont Red line stop, where it gained notoriety for its extensive selection of grilled cheese sandwiches and cheap liquor. Evanston resident Grace Pollert, who works in downtown Chicago, said she has always been a fan of the Lakeview restaurant. Cheesie’s menu consists of the “10 Perfect Grilled Cheese sandwiches,” which vary in ingredients and style, in addition to appetizers, sides, salads, soups and a kid’s menu. The Classic, a sandwich filled with grilled American and Merkt’s cheddar cheese and layered with tomatoes, ham and bacon stuffed between thick slices of Texas toast, is among the most popular orders at the restaurant. Pollert, who considers herself a connoisseur of grilled cheese sandwiches, shared her take on Cheesie’s food and pointed out their speciality: the dipping sauces. With every grilled cheese sandwich ordered, Cheesie’s automatically includes a small dish of specially paired dipping sauce. For example, the Caprese is accompanied by a creamy pesto mayo dipping sauce, while the Napoleon is paired with ranch dressing. Cheesie’s is not just a restaurant, but also a pub. Pollert said that she enjoys ordering a beer in addition to her sandwich. The restaurant will also offer a selection of harder liquors. “Once we get the liquor license up, it’ll be $5, all shots, all beers, all drinks, all day, every day, and domestic bottles will be $3,” Johnston said, adding that the store is in the process of acquiring the liquor license from the city of Evanston. He emphasized that the restaurant will “definitely have to card hard” because anyone can come in to the restaurant and they do not want to lose their liquor license.